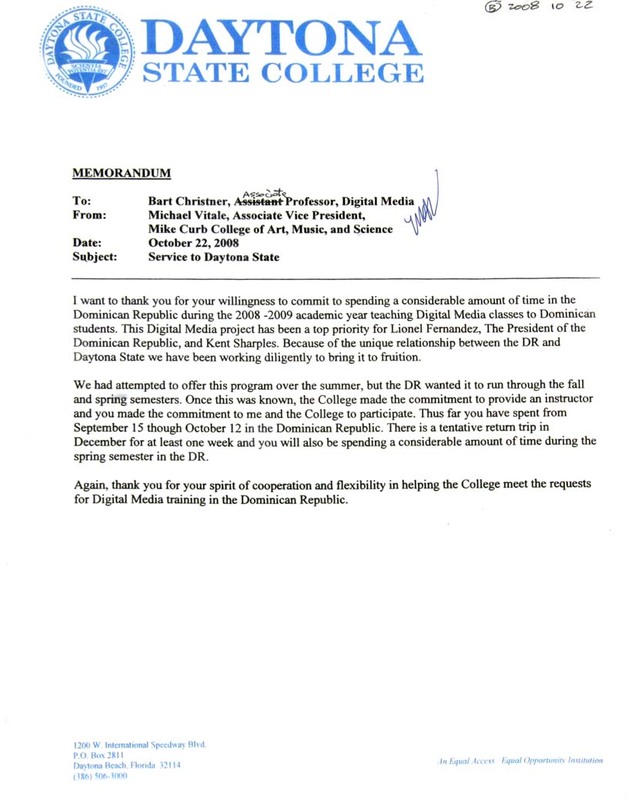 I want to thank you for your willingness to commit to spending a considerable amount of time in the Dominican Republic during the 2008-2009 academic year teaching Digital Media classes to Dominican students. This Digital Media project has been top priority for Lionel Fernandez, The President of the Dominican Republic, and Kent Sharples [President of Daytona State College]. Because of the unique relationship between the DR and Daytona State we have been working diligently to bring it to fruition. We had attempted to offer this program over the summer, but the DR wanted it run through the fall and spring semesters. Once this was known, the College made a committment to provide an instructor and you made the committment to me and the College to participate. Thus far you have spent from September 15 through October 12 in the Dominican Republic. There is a tentative return trip in December for at least one week and you will also be spending a considerable amount of time during the spring semester in the DR.
Again, thank you for your spirit of cooperation and flexibility in helping the College meet the requests for Digital Media training in the Dominican Republic.